When I was in grad school, I was a teaching assistant in an art history survey course that had the neatest syllabus at which I ever squinted at eight in the morning. It did not go chronologically through Western art, covering the history of art starting with the cave paintings in France and Spain, then on to the Ancient Near East, then Egypt, then the Aegean, then (ta da) Greece and Rome…(are you sleeping yet?). Instead it focused on other cultures in the world that were thriving, if not surpassing those western cultures at the same time. Since we are Westerners, I realize it’s important that we learn the background of Western art that led to present styles, but I’m of the mind that we need to broaden surveys so that we don’t get blinded to the possibility that other hemispheres actually have art that is considered the “epitomy of aesthetics” the way ancient Greek and Roman art are in the West. Asian art is traditionally clustered into two broad groups: Far East Asian and Indian. In the Far East, China was the springboard of all cultures. Sophisticated art was already being produced in China in the Stone Age (2000s BCE) and was centered in cultures mostly in the upper Yellow River area. Pottery shards and skeletal remains found in Beijing indicate that there was human life in China as far back as 500,000 years ago. Persistent culture seems to have developed in the same area some 20,000 years ago. China evolved from a nomadic to settled culture around 1600 CE. It followed a pattern that would last throughout China’s long history: the development of high culture, then invasion by foreign forces, followed by decay and decline, and then another period of high culture. Records from the Zhou Dynasty (1027–256 BCE) mention a “Xia Dynasty” that may have been a transitional culture from the Neolithic period (ca. 2000–1700 BCE) until the first recorded dynasty, which was the Shang (c.1700–1028 BCE). The Shang left evidence of royal houses, carvings in stone, urban centers, script, and bronze vessels. 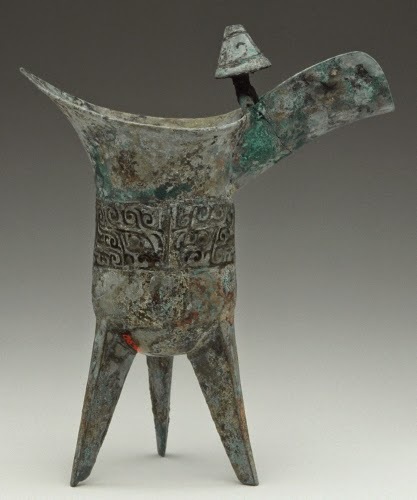 The Chinese probably developed bronze casting around 2000 BCE. 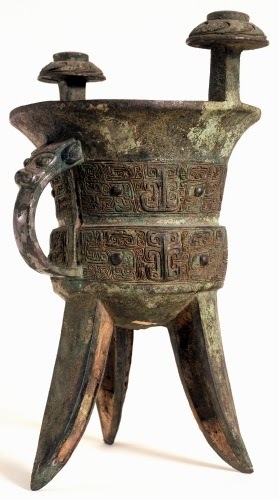 The Bronze Age in China (c. 2000–200 BCE) produced a large variety of vessels all with intricate incised and raised decoration. 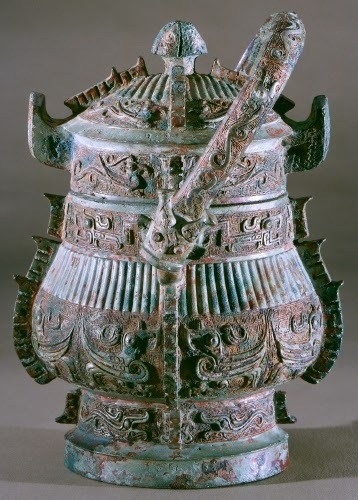 During the mid- to late Shang period, bronze vessels were symbols of status, power, and prestige. Some emperors used nine or ten vessels in a single ceremony while honoring ancestors. 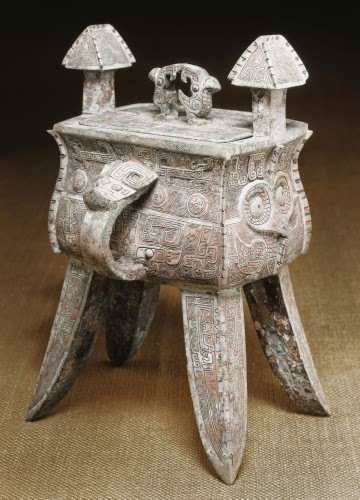 Chinese artists used a piece-mold method of casting, as opposed to the lost-wax method used by all other bronze casting cultures (in which the mold is in one piece). A mold of clay was made from a carved, probably wooden model, made in the four sections of this vessel. Such piece-molds were convenient for reassembling to produce multiple copies of the vessel. 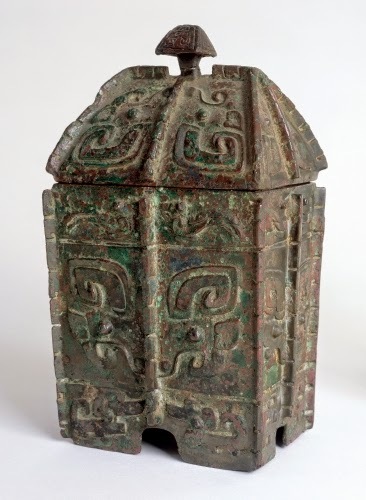 This square Yi was used for wine storage in a royal tomb. The ritual of warming then serving wine to ancestors was practiced every year. Bronze vessels would have been used primarily by the wealthy. The you was also used to store water in tombs for deceased ancestors. The vertical, knob handles helped carry the warm wine after it had been set over a fire to heat. 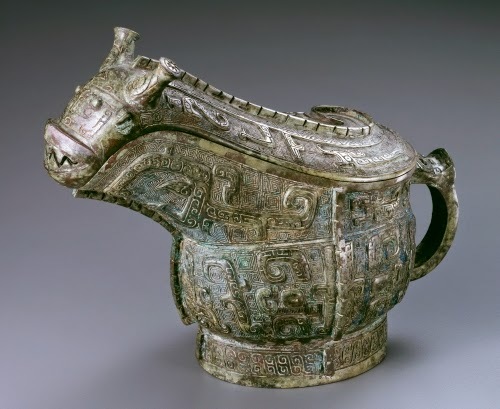 In the late Shang pieces the incised animal designs on the sides of vessels evolved into animal-form vessels. Food was also prepared for deceased ancestors. This form evolved from ceramic examples used in every day food preparation. 2150–roughly 750 BCE: The Neo-Sumerian, Babylonian, Phoenician, and Assyrian cultures flourished and fell. c. 2000–1100 BCE: The rise and eventual decline of the Minoan culture on Crete in the Mediterranean. 1570–1085 BCE: The 18th Dynasty of Egypt flourished, establishing some of the most magnificent monuments and art of the New Kingdom. 1300–1100 BCE: The Helladic (Mycenaean) culture flourished on the Greek mainland, a predecessor of the ancient Greek culture. Studio activity: Design a Shang vessel panel. 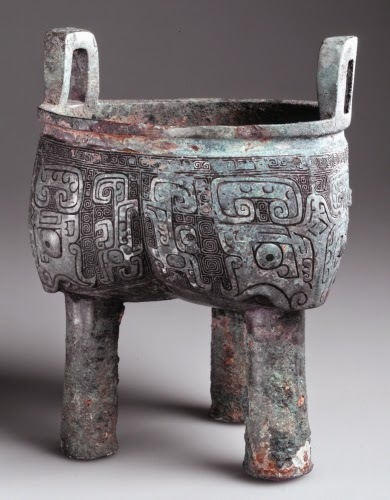 Using pencils and colored pencils, design an individual panel of a square Shang bronze vessel. 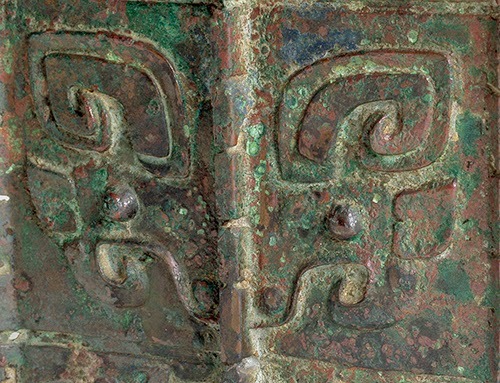 Be sure to include the taotie mask, as many times as you want, but make sure that the panel has symmetrical balance, where each half has the same number and placement of decorative motifs. Try to imagine the vessel when it was first made and what colors you would use to make it look like shiny gold or silver.